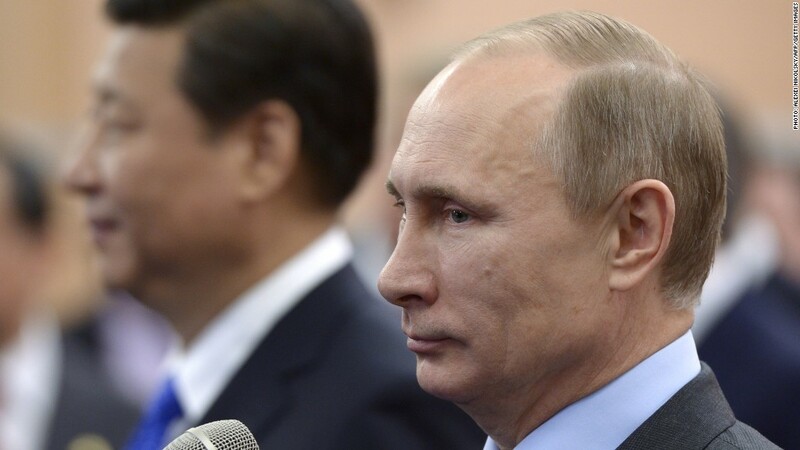 Russian President Vladimir Putin is seeking China's support on Crimea. As the United States and Europe threaten Russia with trade sanctions, Moscow is looking east to Asian countries that might act as an economic bulwark. The Kremlin's calculations rely heavily on China -- already the second largest importer of Russian goods and a voracious energy consumer. Increased Russian reliance on China would be helped along by a thaw in relations between Moscow and Beijing in recent decades. The countries share a border, often team up on U.N. Security Council votes and frequently trade military equipment. Should the West pursue new sanctions to isolate Russia -- possibly in response to further incursions into Ukraine -- those ties will be put to the test. Moscow could also widen the search for support to Japan and India. Energy supplies are likely to feature prominently in any shift to the East. Russia sends more than 7 million barrels of oil a day to the world markets, and its total energy trade earns 70% of its $515 billion in annual export revenue, according to the U.S. Energy information Administration. It has long pursued a natural gas deal with China, but a final agreement between state-owned behemoths Gazprom and China National Petroleum Corp has been delayed by a disagreement over pricing. Now, Russia may be willing to accept a lower price in exchange for the security of having another dedicated buyer for its gas. Elsewhere in Asia, Russia could pursue additional business with South Korea and Japan, two traditional U.S. allies that are also big energy importers. Europe and the U.S. have imposed sanctions on top Russian officials and oligarchs, and one Russian bank, in response to Moscow's annexation of Crimea. They have also warned of tougher measures to come if it destabilizes other parts of Ukraine. Throwing a wrench into energy markets, however, is something western countries hope to avoid given Europe's reliance on Russian gas. There are signs, though, that Russia should not presume total Chinese cooperation if it is forced to pursue alternative markets for its exports. Beijing has been measured in its public position on the crisis in Ukraine, sticking to well-worn statements on the need for dialogue and a diplomatic solution. The Communist Party is extremely wary of popular uprisings, and top officials were reportedly especially unnerved by the events of the Arab Spring. And the idea that a dissatisfied region can break away via referendum -- as happened with Crimea -- sets an unwanted example for Tibet and Xinjiang. This unease was perhaps best reflected in China's decision to abstain, rather than vote with Russia, on a draft U.N. resolution that criticized the Crimea vote. India is another country with cordial relations with Russia. Putin specifically thanked India -- right after China -- for "understanding" Russian actions in Crimea. "We are grateful to the people of China, whose leaders have always considered the situation in Ukraine and Crimea taking into account the full historical and political context, and greatly appreciate India's reserve and objectivity," Putin said last week.